2. 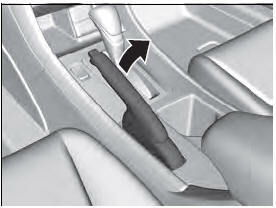 Check that the shift lever is in , then depress the brake pedal. - Although it is possible to start the vehicle in , it is safer to start it in . 2. Check that the shift lever is in . 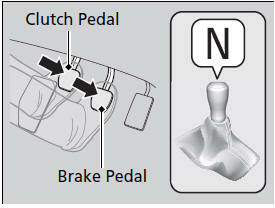 Then depress the brake pedal with your right foot, and the clutch pedal with your left foot. - The clutch pedal must be fully depressed to start the engine. When starting the engine in cold weather, turn off all electrical accessories such as the lights, heating and cooling system*/climate control system*, and rear defogger in order to reduce battery drain. If you live in a region where winter is extremely cold, an engine block heater will improve starting and warming of the engine. If temperatures consistently below -22°F (-30°C) are expected, the coolant mixture should be charged to a higher concentration to prevent freezing. Consult a dealer for details. 3. Turn the ignition switch to START without depressing the accelerator pedal. Do not hold the key in START (e for more than 15 seconds. • If the engine does not start right away, wait for at least 10 seconds before trying again. • If the engine starts, but then immediately stops, wait at least 10 seconds before repeating step 3 while gently depressing the accelerator pedal. 1. Keeping your right foot on the brake pedal, release the parking brake. Check that the brake system indicator has gone off. 2. Put the shift lever in . Select when reversing. 3. Gradually release the brake pedal and gently depress the accelerator pedal to pull away. 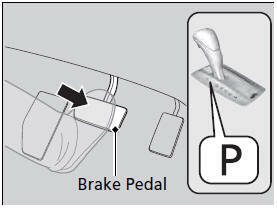 Depress the clutch pedal, and shift to when facing uphill, or when facing downhill, then release the brake pedal. 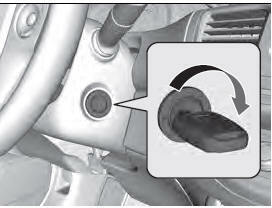 Move the shift lever to , , or * when facing uphill, or when facing downhill, then release the brake pedal.